This time I’m not packing heat so we are headed to Nova Scotia to see the whales. A pistol I’d packed in our camper got in the way of our trip plans nearly three decades ago. cop warned me that if I were caught crossing the Canadian border with my 38-caliber, Smith & Wesson in our Apache pop-up, I would go straight to jail. We were a young, camping family back in those penny-pinching days when I was the sole breadwinner. There was no way I would chance arrest and jail time. So rather than cross into Canada at Buffalo, N.Y., for the long drive to Nova Scotia then ferry ride to Bar Harbor, Maine, we got into our Jeep, took a sharp right turn and towed our camper direct to Bar Harbor. Amending our travel plans was no big deal back then. We were pretty loose at the time and frequently hit the road with little notice and less planning. Betty’s thrift and our adventuresome spirit made for a lot of fun camping trips despite my meager, newspaperman’s pay. We had a great time in Maine, Nantucket and other stops on that three-week, driving vacation loop across much of the Northeast. But we always regretted not having made it to Nova Scotia. Our circumstances have changed a lot since then – mainly for the better except for the aches of strains of age. We sold our camper years ago in favor of vacations in condos, hotels and cruise ships. But old habits die hard so we still look for bargains and take advantage of any senior discounts we can find. When it became clear some months ago that Casey was in fact going to graduate from business school on schedule, Betty and I booked a room at the Hyatt Regency in Cambridge, Mass. (full rack rates with no senior discounts during graduation week) and flights from our home in Memphis to Boston. We of course wanted to attend the diploma ceremony. We decided to leverage the expense of our air travel and the availability of Casey’s SUV so we could also visit Nova Scotia. 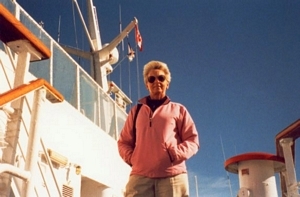 I had been in touch with the operators of the cruise ship Scotia Prince and learned there are some good packages at bargain rates for the 200-mile sailing from Portland, Maine to Yarmouth, Nova Scotia. The weather can be rather cool and sometimes stormy in June, which makes for relatively few tourists and terrific prices during Nova Scotia’s shoulder season. The package we selected was “The Great Getaway.” It included an upgraded, outside cabin with porthole, private restroom and shower facility for the overnight sailing to Yarmouth and also the all-day sailing back to Portland; two nights at the three-star, Grand Rodd Hotel in Yarmouth; two hot breakfasts and one dinner with wine at the hotel; plus shuttle service to and from the dock to the hotel. All this for the both of us was only $556 – about what we paid for one night’s lodging and dinner for four at the Cambridge Hyatt. The weather smiled on us during our two, full days in Nova Scotia. We toured Yarmouth’s scenic harbor on rented bicycles and visited an interesting museum devoted to commercial fishing. We drove to the Bay of Fundy in a rental car, boarded a whale watch boat and were thrilled by a series of up-close sightings of the magnificent mammals. It was a great trip, made all the better because it was delayed for so many years. We had enjoyed a wonderful dinner with Casey and his girlfriend, Caroline Cardon of Atlanta, the previous night in the Hyatt’s revolving restaurant, The Spinnaker, to celebrate his award earlier in the day of an MBA degree. Betty and I slept until 8 a.m. and awakened in our 12th floor room about 8 a.m. Our terrace that came with a room upgrade is enormous, perhaps 25 feet long and 15 feet wide. It overlooks the scenic and historic Charles River and much of the Boston/Cambridge skyline, making it a perfect setting for photos. We could see that crews were up early to practice their rowing in the still, cool New England morning. One single scull’s oarsman had a mirror mounted on his baseball cap so he could see where the craft was heading and navigate the bridge piers. A small powerboat accompanied several four-place sculls whose disciplined crews were obviously training. The sun was shining and the surface of the tidal river was quiet before the ocean breeze could kick up small wavelets later in the day. The Boston University boat dock is a few hundred yards downstream of the Hyatt. The sailing schedule for the Scotia Prince gives us a full day to make the two-hour drive from Boston to the debarkation point at Portland, Maine. So we were in no hurry to check out. I spent an hour in the Hyatt’s Zephyr fitness facility, which includes an indoor lap pool and a rooftop sunning area with a somewhat distant view of the Charles River. The weightlifting room is reasonably well equipped for a hotel. However, the Zephyr’s emphasis is clearly on aerobic equipment, with various cycling and walking machines mounted in a glass gallery by the pool. We checked out of the hotel just before noon. Casey and Caroline picked us up in his year-old, Ford Explorer. He let me drive them back to campus so I would learn how to get the vehicle through the security scanning equipment at the entrance to the HBS parking garage. She flies home to Atlanta tomorrow to prepare for her CPA exam. He flies to Lima tomorrow with three buddies from his four years at the University of Virginia (also Caroline’s alma mater), for a celebratory trip of adventure hiking and touring in Peru and Bolivia. The timing is perfect for us since we can use his SUV for the drive to Portland and back. Casey had prepared some excellent driving directions for us. We easily got on I-90 East a short distance from HBS and drove through Boston’s Big Dig labyrinth of tunnels under the main part of the city. We eventually got on I-93 North and ultimately I-95 North to Portland. Even at mid-day, traffic was busy. But it moved at good speed and we made it through town without a hitch. With lots of time on our hands, we stopped at the tourist welcome centers in both New Hampshire and Maine and passed through Portland with hours to spare. 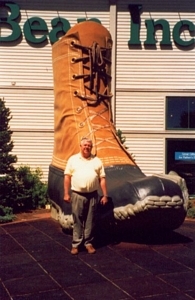 Betty had wanted to visit the famous L. L. Bean outdoor equipment and clothing store at Freeport, Maine, about 15 miles to the north of Portland on I-295. I’m glad we went a few miles out of the way. The L.L. Bean complex of stores and outdoor displays of tents, canoes and other equipment is as big as a small mall. It is such a magnet for its mail-order customers that the town of Freeport has been pretty much built around it. Freeport advertises itself as “Maine’s No. 1 Destination.” It is a shopper’s paradise, with dozens of big-name and little-name stores and factory outlets, ranging from Burberry, Brooks Brothers and Polo Ralph Lauren on the high end to Banana Republic, Gap and S&K Menswear on the moderate end. There are scads of arts, crafts and specialty stores. Supporting all that ching-ching retailing are B&B’s, restaurants for every taste and the usual services found in any prosperous town. But Freeport really isn’t so much a town as it is a thriving, seasonal village built around L.L. Bean. Zoning regulations and building codes keep Freeport looking like a quaint, New England village. At one of the main intersections is the first McDonald’s I’ve seen without golden arches. The restaurant is cleverly built to look like a two-story, wooden home. Freeport is amazingly tidy and is akin to a giant outdoor shopping mall, with public streets. Betty shopped at the L.L. Bean Flagship Store, which is as big as the Sears Department Store we patronize in East Memphis. The layout seemed to be unusually spacious and well lighted, with none of the piled-high busyness that I find so offensive in some retailers. There are comfortable chairs and couches here and there for non-shoppers (like me). One grouping in the middle of a bookstore area attracted several other men. Most of the books were predictably about Maine and the outdoors; nobody objected when patient browsers took books off the shelves to thumb through them while their wives or girlfriends shopped. Quality place, indeed. In addition to the flagship, affiliate stores nearby include a freestanding L. L. Bean Hunting & Fishing Store and the L. L. Bean Factory Store. the Scotia Prince office in the harbor’s ship terminal and picking up our boarding passes and cabin assignment, we found ourselves with three hours to kill. Portland is a harbor town that is scenic enough, but we didn’t come to shop. We walked around the waterfront on a cool, beautiful afternoon but found little of interest. There are lots of places that cater to tourists – parking lots, bars, excursion and fishing boats and a few restaurants that seemed to be overpriced. It must be that they have to make their money in the few warm months of the year and charge accordingly. The Portland Lobster Co. is on a dock and serves fresh Maine lobster on paper plates. It charges $5 for a small, plastic cup of cheap wine and $3 for a bottle of Bud Light. A crab roll is $17 and lobster “market price,” which means whatever the market will bear. We passed on the $27 special, served with French fries. To our surprise, a bluegrass trio played what passes for hillbilly music in this northern clime. We stopped at a few stores but didn’t find anything appealing enough to buy other than a small bottle of gin for a bit less than I pay in Memphis. I later learned the Scotia Prince prohibits alcohol (and recreational drugs) from being carried aboard. But neither the U.S./Canadian Customs agents and ship officials seem to check bags or plastic water bottles closely, relying on passengers “yes” or “no” answers to screening questions. With the thorough combing we have endured at Logan Airport’s baggage screening still fresh in my memory, I was amazed at the cursory scrutiny at the Portland ship terminal. Once beyond the Customs checkpoint, we sat on hard, wooden benches in a waiting room with all the comfort and charm of a 1960s bus terminal. Our fellow passengers looked like they would be more likely to shop in Wal-Mart than in Saks Fifth Avenue; one group seemed to be affiliated with a sanitation union in New York City. As boarding time neared, there was a mob rush to the lineup. Betty and I held back and stayed seated while most of our fellow passengers (perhaps 150-to-200 in all) jostled their baggage in line. Once the rush cleared, we smiled at the ship’s photographers but unlike many other passengers, we declined to have our pictures taken in front of the tacky background props. A muscular crewman of Asian appearance helped carry our bags up the metal ramp to the ship and directed us to our nicely located cabin, which happily was near the main lobby.